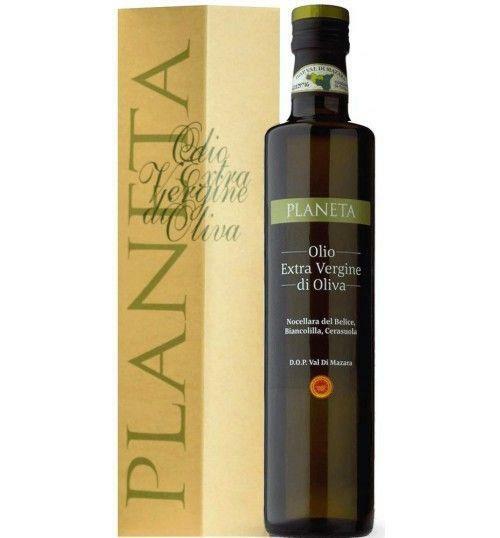 The Extra Virgin Olive Oil DOP 'Val di Mazara' by Planeta is a fruity, sharp, spicy and intense oil, which comes from the cold pressing of whole olives of Nocellara del Belice, Biancolilla and Cerasuola, combined in blend. excellent on vegetable and legume soups, fresh cheeses and above all fish and grilled meats. THE OIL The Extra Virgin Olive Oil DOP 'Val di Mazara' by Planeta is a fruity, sharp, spicy and intense oil, which comes from the cold pressing of whole olives of Nocellara del Belice, Biancolilla and Cerasuola, combined in blend. excellent on vegetable and legume soups, fresh cheeses and above all fish and grilled meats. Our oil Extra-virgin olive oil is, together with wine, the other great family passion. The large olive grove at Capparrina, at Menfi, relates the history of our love for this product, together with that of our commitment to safeguarding the countryside and nature. The oldest maps of Ulmo show that already half a century ago olives were cultivated on our land, in one of the areas best known for the production of olive oil. Our family has always been linked to this product which so forcefully represents Sicily and the Mediterranean. At Capparrina we planted our olive grove to ensure that the coast at Menfi should remain free of buildings for ever, placing once more the protection of the countryside above the interests of family and business. Today we care for 98 hectares of olives which descend the hill towards the white beach of Porto Palo of Menfi, 19 times Blue and Green Flags, in a context of great biodiversity in which rare examples of flora and fauna co-exist. Through our olive oil we are happy to contribute to consolidating and diffusing the culture of quality extra-virgin olive oil, in the kitchen and on the table. The continuous and careful research into the cultivars of local tradition, regulated by the DOP Val di Mazara – Nocellara del Belice, Biancolilla and Cerasuola – accounts for the quality of our three olive oils. Hand-picking and immediate pressing in our olive press allow us to treat them well and to extract the maximum tasting expression. Why Dop The DOP Val di Mazara protection cultivars related to territory of western Sicily and in particular the three that best identify it: Nocellara, Biancolilla and Cerasuola, all three present in our olive grove and our oil. Our production takes place in strict observance of the specification. THE COMPANY Established in 1995, Planeta is a Sicilian wine producer built on a long agricultural tradition handed down since 1500 through 17 generations in the area between Sambuca di Sicilia and Menfi. Today Planeta represents not just one, but six ways of developing the territory, in six different settings. There are, in fact, six Planeta wine producing estates, each one with a specific research and development project. Ulmo, at Sambuca di Sicilia, Dispensa, at Menfi; Dorilli, at Victoria; Buonivini at Noto, Feudo di Mezzo at Etna in Castiglione di Sicilia, and finally, La Baronia, at Capo Milazzo. These are the Planeta locations, comprising a total surface area of 363 hectares of vineyards. Through its family properties, Planeta can conduct a virtual journey around Sicily and its greatest wines. The stages are up-to-date and innovative yet consistent with a historical and ritualistic interpretation that elsewhere has almost been forgotten. Planeta's project calls for patient and meticulous research, never hurried, and looks just as much to the past as to the future. On the one hand, a deep bond with the oldest wine-making Sicilian tradition, with its heritage of native varieties: Grecanico, Carricante, Moscato di Noto, Frappato, Nerello Mascalese and Nero d'Avola. On the other, the arena in which the greatest producers of the five continents are appraised for Chardonnay, Syrah, Merlot, Cabernet: magnificent classics of international enology interpreted by a territory which puts its unmistakable mark on them. It is paramount to remember the most inspired and visionary varietal experimentation: it has resulted in obtaining for the first time in Sicily a Fiano with truly revolutionary features. And then,that unique green gold, the Planetas' other passion: extra virgin olive oil produced in the natural oasis of Capparrina, near the beaches of Menfi. The company's activity has one absolutely essential point of reference: environmental sustainability, achieved through landscape conservation, renewable energy, recycled materials and sustainable agriculture, with the utmost respect for the territory, cultural heritage and the communities within which the company operates. Alessio, Francesca and Santi Planeta gave life to this project, but behind them they have the whole family, rooted in the reality of Sicilian agriculture for generations, beginning with Diego Planeta, considered the leading figure in the rebirth of the Sicilian wine industry in the last forty years. A brand, a family that has aimed at ambitious goals, following the lode-star of quality. 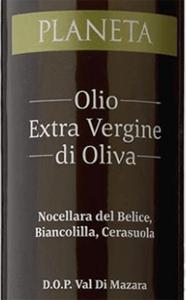 Extra-virgin olive oil is, together with wine, the other great family passion. The large olive grove at Capparrina, at Menfi, relates the history of our love for this product, together with that of our commitment to safeguarding the countryside and nature. The oldest maps of Ulmo show that already half a century ago olives were cultivated on our land, in one of the areas best known for the production of olive oil. Our family has always been linked to this product which so forcefully represents Sicily and the Mediterranean. At Capparrina we planted our olive grove to ensure that the coast at Menfi should remain free of buildings for ever, placing once more the protection of the countryside above the interests of family and business. Today we care for 98 hectares of olives which descend the hill towards the white beach of Porto Palo of Menfi, 19 times Blue and Green Flags, in a context of great biodiversity in which rare examples of flora and fauna co-exist. Through our olive oil we are happy to contribute to consolidating and diffusing the culture of quality extra-virgin olive oil, in the kitchen and on the table. The continuous and careful research into the cultivars of local tradition, regulated by the DOP Val di Mazara – Nocellara del Belice, Biancolilla and Cerasuola – accounts for the quality of our three olive oils. Hand-picking and immediate pressing in our olive press allow us to treat them well and to extract the maximum tasting expression. The DOP Val di Mazara protection cultivars related to territory of western Sicily and in particular the three that best identify it: Nocellara, Biancolilla and Cerasuola, all three present in our olive grove and our oil. Our production takes place in strict observance of the specification. Today Planeta represents not just one, but six ways of developing the territory, in six different settings. There are, in fact, six Planeta wine producing estates, each one with a specific research and development project. Ulmo, at Sambuca di Sicilia, Dispensa, at Menfi; Dorilli, at Victoria; Buonivini at Noto, Feudo di Mezzo at Etna in Castiglione di Sicilia, and finally, La Baronia, at Capo Milazzo. These are the Planeta locations, comprising a total surface area of 363 hectares of vineyards. Through its family properties, Planeta can conduct a virtual journey around Sicily and its greatest wines. The stages are up-to-date and innovative yet consistent with a historical and ritualistic interpretation that elsewhere has almost been forgotten. Planeta's project calls for patient and meticulous research, never hurried, and looks just as much to the past as to the future. On the one hand, a deep bond with the oldest wine-making Sicilian tradition, with its heritage of native varieties: Grecanico, Carricante, Moscato di Noto, Frappato, Nerello Mascalese and Nero d'Avola. On the other, the arena in which the greatest producers of the five continents are appraised for Chardonnay, Syrah, Merlot, Cabernet: magnificent classics of international enology interpreted by a territory which puts its unmistakable mark on them. It is paramount to remember the most inspired and visionary varietal experimentation: it has resulted in obtaining for the first time in Sicily a Fiano with truly revolutionary features. And then,that unique green gold, the Planetas' other passion: extra virgin olive oil produced in the natural oasis of Capparrina, near the beaches of Menfi. The company's activity has one absolutely essential point of reference: environmental sustainability, achieved through landscape conservation, renewable energy, recycled materials and sustainable agriculture, with the utmost respect for the territory, cultural heritage and the communities within which the company operates. Alessio, Francesca and Santi Planeta gave life to this project, but behind them they have the whole family, rooted in the reality of Sicilian agriculture for generations, beginning with Diego Planeta, considered the leading figure in the rebirth of the Sicilian wine industry in the last forty years. A brand, a family that has aimed at ambitious goals, following the lode-star of quality.